My family loves having fun! 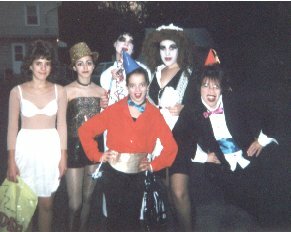 My favorite movie is "Rocky Horror Picture Show", and last year we went "trick-or-treating" as characters from the movie...we didn't go for the candy...i don't even eat candy...we went for the reactions. Unfortunately, we didn't get quite the response we had hoped for. Most people had no idea what we were, and others were just scared. A few people got it, and they appreciated it...but the majority of the people thought we were badly dressed party-goers. We had a lot of fun getting ready to go, and an even better time parading around the neighborhood in outrageous outfits. Check out some of the pictures we took. 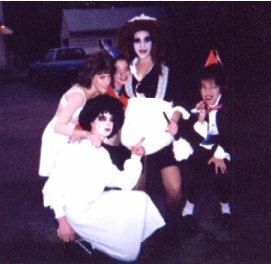 In the front it's Scott as "Dr. Frank N. Furter", in the back from left to right it's Alex as "Janet Weiss", Madison as a "Time Warper", me (Gwen) as "Magenta", and my mom (Terry) as a "Time Warper". In the front it's Madison as a "Time Warper". In the back from left to right is Alex as "Janet Weiss", Emily as "Colombia", Scott as "Dr. Frank N. Furter", me as "Magenta", and my mom as a " Time Warper".